"Talkers" redirects here. For the Internet chat server type, see Talker. 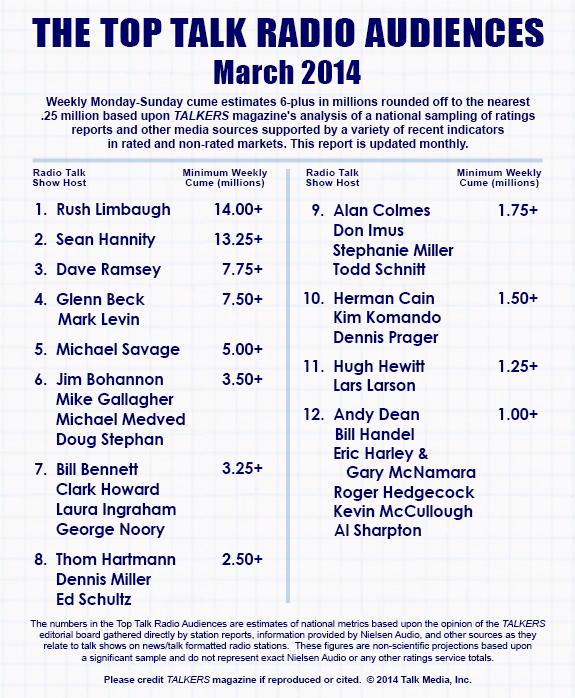 Talkers Magazine is a trade-industry publication related to talk radio in the United States. Its slogan is "The Bible of Talk Radio and the New Talk Media". In addition to radio, it also covers talk shows on broadcast and cable television, as well as Internet-only shows and podcasting. The magazine advocates the advancement of conservative, progressive, and apolitical talk radio. Ratings for talk shows are based upon "the opinion of the TALKERS editorial board" and are "non-scientific projections... and do not represent exact Nielsen Audio or any other ratings service totals." Talkers was launched in summer 1990 by current publisher Michael Harrison. It publishes 10 issues per year from Springfield, Massachusetts. The magazine is owned by Talk Media, Inc. The magazine's online counterpart is TALKERS.com, which provides free access to all content from the print version. Talkers also produces its own original podcasts via their sister site, PodJockey.com. Talkers acquired RadioInfo.com, a radio news and information site previously owned and operated by the estate of Doug Fleming, in August 2012. That site's message boards would continue to be held by the Fleming estate. ^ May, Caroline (March 14, 2012). Talkers magazine publisher: Limbaugh likely ‘has the biggest audience he’s had in years’. The Daily Caller. Retrieved March 14, 2012. ^ www.talkers.com audience chart. (April, 2014). ^ "Heavy Hundred". Talkers magazine. Retrieved 6 Sep 2011. ^ "Frontier Fifty". Talkers magazine. Retrieved 7 September 2011.